Fresh Green olives are nearly round with an elongated shape. They measure between 2 and 4 centimeters long depending on the variety. 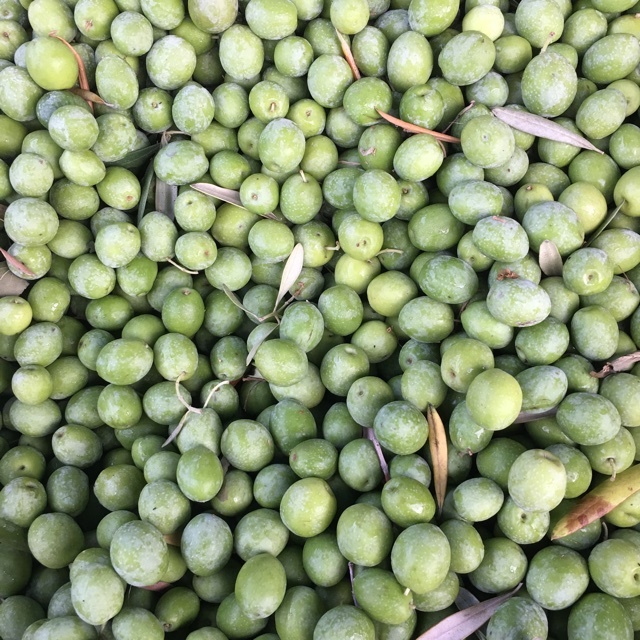 Fresh Green olives are picked before they begin to change color from green to yellow-green or just before the red-ripe stage. The fruits can range in color from dark to light green blushed with red, known as the ‘veraison’ stage. The flesh is very firm and has a grassy, bitter flavor that can coat the tongue for hours. In the center is an oblong seed or kernel up to 2 centimeters long. Fresh Green olives are available in the mid to late-fall months. Fresh Green olives are immature fruits of the European olive tree, botanically classified as Olea europaea. 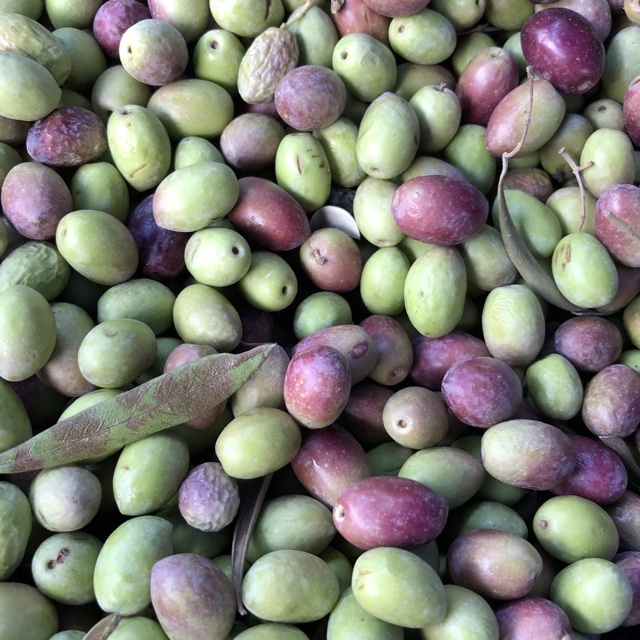 There are dozens of varieties of olives, some harvested while still green and immature, while others are left to ripen on the tree. Varieties picked green include home curing favorite Barouni, the large Sevillano, and the French Picholine. Olives were one of the very first trees to be cultivated and date back to the beginning of Western civilization. Fresh Green olives are rich in oleic acid, monounsaturated fats, and high in polyphenols which give them their bitter flavor and provide antioxidant benefits. During this immature stage, they also contain a high amount of chlorophyll. The fruits are a good source of vitamins E and K and the minerals copper and iron. Fresh Green olives must be cured before eating. A cut is made in the fruit and they generally begin with a few repeated soaks in lye to remove the bitter compound oleuropein. Pre-soaking in lye is not required but does impact the final flavor and texture. After a soak, they can be cured, or fermented, one of several ways: packed in salt, in a salt brine, or in water depending on the desired result and length of time available. Once soaked and cured, Fresh Green olives can be stuffed with blue cheese, nuts, the traditional pimento peppers, jalapenos, garlic, onions or capers. They can be chopped for tapenade or bruschetta, mixed into a chutney or enjoyed as-is alongside charcuterie and wine. Store Fresh Green olives for up to a week in the refrigerator. Cured olives will keep for up to a year. Olives have been used for both their fruits and the oil produced from them for thousands of years. They appear throughout written history, used for religious and cultural purposes. The oil was first used by the Assyrians to light torches and for religious ceremonies. Olives are native to the Mediterranean region and parts of Africa and Asia. The earliest traces of olive trees can be traced to Spain around the year 8000 BCE, and they were first cultivated in Crete around 2500 BCE. Olives grow best in frost-free, tropical to subtropical environments and prefer climates like that of the Mediterranean region. They are cultivated in Chile, Argentina, South Africa, California, Australia, Israel and the Palestinian Territories.  Fresh Green olives are most likely spotted at farmer’s markets or specialty stores in areas where they are cultivated. Recipes that include Fresh Green Olives. One is easiest, three is harder. 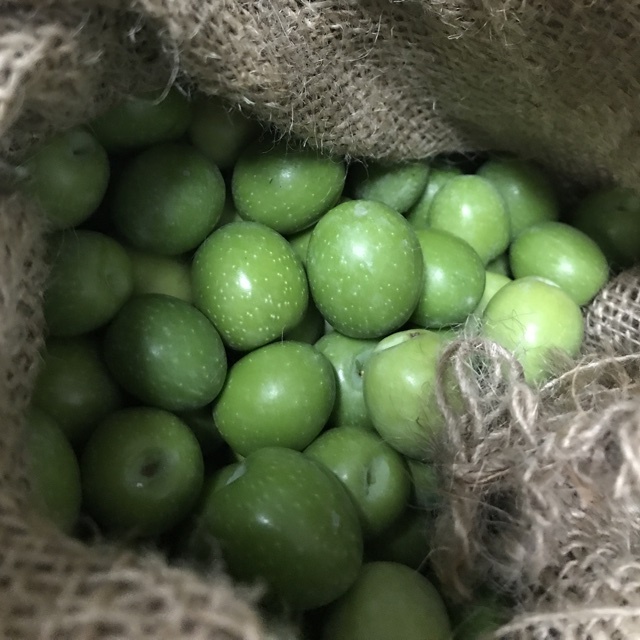 People have shared Fresh Green Olives using the Specialty Produce app for iPhone and Android. 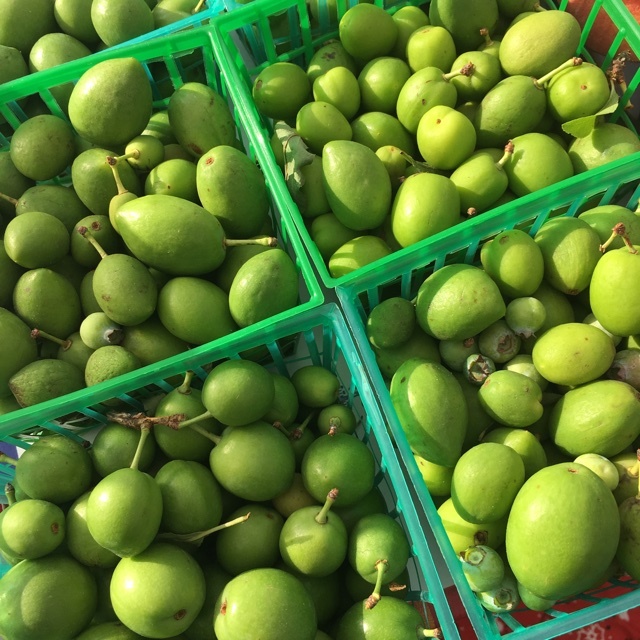 Sharer's comments : Fresh Olives spotted at Santa Monica Farmers Market. Sharer's comments : Fresh Olives spotted at Specialty Produce.